This is a raised bed ready to plant. After the squash was done in late summer, I threw into the raked out bed about 3 trashcans of compost. 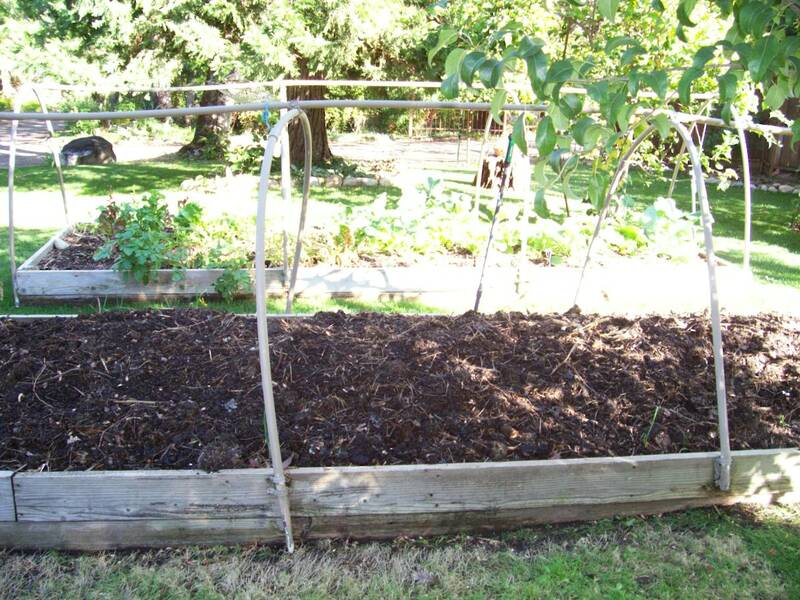 What is in late summer homemade compost? Mostly grass clippings because we have so much lawn, also corn stalks, spent flower blossoms, bush trimmings that I threw onto the lawn to mow over, and of course, kitchen waste like eggshells, moldy cheese and coffee grounds. After this is spread over the top, I sprinkle some iron, some phosphate, some lime (calcium sulfate), some epsom salts (magnesium sulfate) and some wood ash rich in potassium (aka potash) from the fire pit. I turn all this in with the pitchfork and try to avoid injuring any earthworms as I rake the bed level. I never can resist putting a handful of the new dirt up to my nose to smell. It’s one of the loveliest natural smells in the world, ranking right up there with baby’s skin. My eyes fall on a morbidly obese earthworm. I bend over for a closer look, then pick him up to run show my husband who is fixing a sprinkler head on the other side of the yard. We agree that he is the FATTEST one we’ve seen in a month. I drop the worm off in the asparagus bed on my way back, throwing a little dirt over him to hide him from the blue jays I hear screeching in the pine tree. Then I stand back and admire the dark brown color and the fluffy and chunky texture and think to myself, “If I were a seed, this is exactly where I would hope all my life to be planted.” And I think about the millions of species of microbes in there that facilitate nutrient uptake by the plant. This entry was posted in Uncategorized and tagged gardening, grow food, grow vegetables, health, healthy, landscaping, nutrition, nutritionist, registered dietitian, Shasta county, Siskiyou County. Bookmark the permalink.